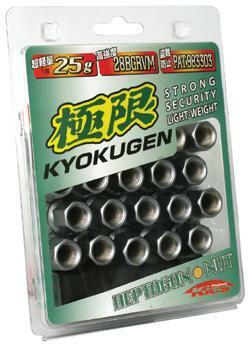 Project Kics Kyokugen Lug Nuts UNIVERSAL - Pann Auto Performance - San Diego largest aftermarket automotive performance parts - What do you drive? The Project Kics Kyokugen Lug Nuts are the original lightweight Lugs developed specifically for high end tuner and sport compact cars. 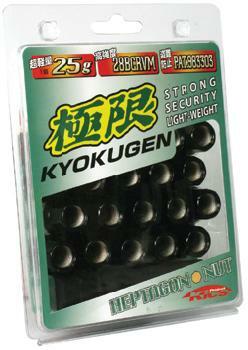 Each nut weights 25g. 1/3 material weight compared to standard lugs helps improve vehicle performance. 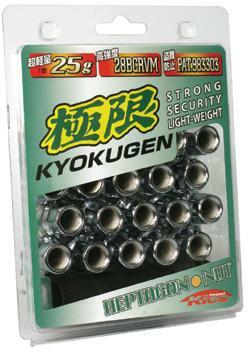 Made by chrome vanadium 28dcrvm spec, which enables the nut to be made smaller, lighter, and just as strong (if not stronger) then other standard nuts.